Draft: 2009, Minnesota Twins, 6th rd. Christopher Ryan Herrmann was originally signed by Twins scout Hector Otero…is married, Shelby…has a son, Crew, born in 2017…did their baby gender reveal at Chase Field on dbTV.… graduated from Tomball (TX) High School in 2006…attended Alvin Community College and the University of Miami…named to the NJCAA Division I All-American Team and to the JUCO World Series All-Tournament Team in 2008…honored with the NJCAA Rawlings Big Stick Award…led the Hurricanes in average (.341), runs scored (59) and on-base percentage (.458) as a junior in 2009. Was with Arizona during Spring Training before he was designated for assignment March 25… signed a minor league deal with Seattle April 5 and started the year at Triple-A Tacoma before joining the Mariners May 27…with the exception of a three-week stint on the disabled list, he spent the rest of the season with Seattle but appeared in just 36 games…batted .237 with seven RBI…added 10 walks for a .322 on-base percentage…eight of his 18 hits were for extra bases (four doubles, two triples, two home runs) and he slugged .421…went 3-for-11 (.273) against left-handed pitchers, 15-for-65 (.231) with both of his home runs and all seven of his RBI against right-handers…had a .270 batting average with runners on base but hit .158 with runners in scoring position…batted .293 on the road, .171 with both of his home runs at Safeco Field…hit .268 at night, .150 during the day…had a .186 batting average over the first six innings of a game, .303 with both of his home runs from the seventh inning on…appeared in 28 games at catcher and one at first base…made 21 starts, all behind the plate…committed one error at catcher for a .993 fielding percentage…tossed out 3-of-14 (17.6%) attempted base stealers…went 1-for-8 (.125) with a home run and three RBI as a pinch hitter and is now 8-for-77 (.104) in the pinch in his career…started games in the six through nine spots in the order and made his most starts batting eighth (11)…hit .303 in 15 games overall in the eight spot, .186 in all other spots. when he was not tendered a contract. 18 against Albuquerque…then collected a season high in hits two days later against the Isotopes when he was 3-for-3 with two walks…drew at least one walk in 17 of his 18 games in April when he batted .271 with a .463 on-base percentage…tied for the Pacific Coast League lead in walks in April (21) and tied for second in on-base percentage…hit five of his six home runs with the Rainiers over a 13-game span from May 10 to 26…went 12-for-46 (.261) with 10 RBI over that span… was batting .266 in 37 games when he was promoted to Seattle May 28. Batted .181/.273 OBP/.345 SLG with 7 doubles, a career-high 10 home runs and 27 RBI in 106 games during his second season with the D-backs...also set career highs in runs (35) and total bases (78)...Made 51 starts (34 at catcher, 17 in left field, 1 in right field and 1 at first base). Set career highs in nearly every offensive category in his first season with the D-backs, including average (.284), runs (21) hits (42), triples (4), homers (6), RBI (28) and stolen bases (4)...On the 15-day disabled list from July 17-Sept. 6 with a strained right hamstring…underwent surgery to repair 2 broken meta-carpals in his left hand on Sept. 13 by Dr. Don Sheridan...Threw out 35.3 pct. of attempted basestealers (6-for-17)...Made 29 starts at catcher, 3 in left field, 2 in right and 1 in center...Recorded his first career multi-homer game May 8 @ Braves…he was the first player with multiple homers on 0-2 count since Lance Berkman on July 9, 2000 vs. Royals...Became the first D-back to start a game at catcher and center field in the same season on May 15 vs. Giants…the last MLB player to do this was the Tigers' Brandon Inge in 2008... Ranked among the NL leaders during the month of May, in-cluding: slugging pct. (3rd, .679), OPS (3rd, 1.122), average (5th, .377) and on-base pct. (6th, .443). Split the season between the Twins and Triple-A Rochester… appeared in 45 games with Minnesota and hit .146 (15-for-103) with 5 doubles, 2 homers and 10 RBI…Played in a career-high 38 games (32 starts) at catcher…also appeared in 2 games in right field and first base…Made his first Opening Day roster. Participated in fourth spring training before being optioned to Triple-A Rochester March 24...Played two games for the Red Wings and was recalled April 7 when Jason Bartlett was placed on 15-day DL...Optioned to Rochester May 8; recalled May 20 and optioned again May 25...Placed on 7-day disabled list with right wrist sprain May 31-June 12...Recalled July 7 and optioned back to Rochester July 18...Placed on 7-day disabled list with right thumb contusion July 22, an injury he suffered July 19 at Norwich, taking a foul ball playing catcher...Played in 27 more games with Red Wings, hitting .291 (25-for-86), including a .351 (20-for-57) average in his final 16...Recalled September 2 and spent rest of season with Twins...Stole first career base September 27 at Detroit off Alex Avila and Kyle Lobstein...Hit .318 (7-for-22) with three doubles, three RBI and three runs scored in final six games. Participated in Twins major league spring training and was optioned March 11...started the season with Triple-A Rochester. Went 4-for-6 with three RBI April 24 at Syracuse. Hit safely in season-high 10 straight games May 23-June 20...was recalled by Minnesota in the middle of the streak on May 27 ... appeared in seven games and was optioned back June 14. Recalled by Minnesota July 14. Went 3-for-5 with a home run and career-high four RBI July 23 at Los Angeles-AL, which included a 10th inning grand slam - the first of three for the Twins on the season. Appeared in 27 games (23 starts) at catcher and 24 games (15 starts) in the outfield. Started season with Double-A New Britain...recorded back-to-back four-hit games May 21 and 22 vs. Binghamton. ... Named Twins minor league Player of the Week May 25, batting .450 (9-for-20) with three doubles, one home run, three RBI and six runs scored. ... Named to Eastern League All-Star team; was the East team's back-up catcher and went 0-for-2. ... Batted .325 (40-for-123) off left-handed pitching and .259 (95-for-367) off right-handed pitching at New Britain. ... Had contract selected by Twins September 14. ... Made major league debut September 16 vs. Chicago-AL as a defensive replacement and later grounded out in first at-bat. ... Recorded first major league RBI, grounding out September 19 at Cleveland. ... Recorded first major league hit, singling off Cody Eppley in the ninth inning September 26 vs. New York-AL. ... Ranked second in the Twins entire organization in runs scored (91), sixth in at-bats (508), seventh in walks (59) and eighth in hits (136). ... Ranked as best defensive catcher in the Twins organization by Baseball America entering the 2013 season. ... Played for Peoria Javelinas in the Arizona Fall League, playing in just three games before leaving due to inflammation in left shoulder; batted.500 (5-for-10) with one double and two walks while there. Started the season with Single-A Ft. Myers and hit safely in 14 of his first 15 games, batting .362 (21-for-58) in that span...Struck out just six times in 106 plate appearances (87 at-bats) at Ft. Myers...Transferred to Double-A New Britain, May 4...went 4-for-6 with a double, a triple and three rbi in his eighth game with the Rock Cats, May 11 at Binghamton...tied his season-high with four hits again, September 4 vs. Trenton...Led the Rock Cats in games caught with 60...played 23 games in the outfield...Combined to bat .269 (114-for-424) with 19 doubles, six triples, eight home runs, 62 rbi and 67 runs scored between the two levels...Named as the catcher on the Minor League Baseball website's 2011 Twins organizational All-Star team...Led the Twins "full season" minor leaguers in walks with 79 between both levels...Played for the Mesa Solar Sox in the Arizona Fall League, batting .380 (19-for-50) with six doubles, two home runs and nine rbi in 15 games. Spent the entire season with Single-A Ft. Myers...finished the season fourth on the team in doubles and games played....ranked fifth onthe team in on-base percentage and rbi...Had an eight-game hitting streak, batting .375 (12-for-43), April 16-26...raised his batting average from .217 to .294 during the streak...Hit .333 (13-for-39) with five runs, three doubles, a triple, home run, four rbi and four walks when batting second in the order...Caught 42 games for the Miracle, throwing out 21 of 59 (36%) potential basestealers...also made 11 appearances in center field and 52in left field...Was named to the Florida State League Mid-Season All-Star Team. Began professional career with Rookie-Level Elizabethton after signing on June 19...had 10-game hit-streak batting .439 (18-for-41) with13 runs, two homers, four rbi, five walks and four doubles, July 7-16...finished fourth in the Appalachian League in runs scored. December 11, 2018 Oakland Athletics signed free agent C Chris Herrmann. 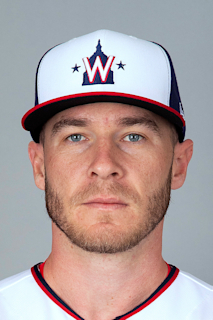 November 30, 2018 C Chris Herrmann elected free agency. November 2, 2018 Houston Astros claimed C Chris Herrmann off waivers from Seattle Mariners. June 18, 2018 Seattle Mariners activated C Chris Herrmann from the 10-day disabled list. June 13, 2018 Seattle Mariners sent C Chris Herrmann on a rehab assignment to Tacoma Rainiers. May 27, 2018 Seattle Mariners selected the contract of C Chris Herrmann from Tacoma Rainiers. April 9, 2018 Seattle Mariners signed free agent C Chris Herrmann to a minor league contract. April 9, 2018 C Chris Herrmann assigned to Tacoma Rainiers. March 26, 2018 Arizona Diamondbacks released C Chris Herrmann. March 25, 2018 Arizona Diamondbacks designated C Chris Herrmann for assignment. October 10, 2017 Arizona Diamondbacks activated C Chris Herrmann. October 6, 2017 Arizona Diamondbacks reassigned C Chris Herrmann to the minor leagues. September 6, 2016 Arizona Diamondbacks activated C Chris Herrmann from the 15-day disabled list. August 29, 2016 Arizona Diamondbacks sent C Chris Herrmann on a rehab assignment to Reno Aces. August 15, 2016 Arizona Diamondbacks sent C Chris Herrmann on a rehab assignment to AZL D-backs. July 17, 2016 Arizona Diamondbacks placed C Chris Herrmann on the 15-day disabled list. Strained right hamstring. November 10, 2015 Minnesota Twins traded C Chris Herrmann to Arizona Diamondbacks for 1B Daniel Palka. August 7, 2015 Minnesota Twins recalled C Chris Herrmann from Rochester Red Wings. July 8, 2015 Minnesota Twins optioned C Chris Herrmann to Rochester Red Wings. September 2, 2014 Minnesota Twins recalled Chris Herrmann from Rochester Red Wings. August 4, 2014 Rochester Red Wings activated RF Chris Herrmann from the 7-day disabled list. July 22, 2014 Rochester Red Wings placed RF Chris Herrmann on the 7-day disabled list. Right thumb contusion. July 18, 2014 Minnesota Twins optioned RF Chris Herrmann to Rochester Red Wings. July 8, 2014 Minnesota Twins recalled Chris Herrmann from Rochester Red Wings. June 12, 2014 Rochester Red Wings activated RF Chris Herrmann from the 7-day disabled list. May 31, 2014 Rochester Red Wings placed RF Chris Herrmann on the 7-day disabled list. Sprained right wrist. May 26, 2014 Minnesota Twins optioned RF Chris Herrmann to Rochester Red Wings. May 19, 2014 Minnesota Twins recalled Chris Herrmann from Rochester Red Wings. May 9, 2014 Minnesota Twins optioned RF Chris Herrmann to Rochester Red Wings. April 7, 2014 Minnesota Twins recalled Chris Herrmann from Rochester Red Wings. March 24, 2014 Minnesota Twins optioned C Chris Herrmann to Rochester Red Wings. October 18, 2013 C Chris Herrmann assigned to Estrellas de Oriente. July 16, 2013 Minnesota Twins recalled Chris Herrmann from Rochester Red Wings. June 15, 2013 Minnesota Twins optioned Chris Herrmann to Rochester Red Wings. May 27, 2013 Minnesota Twins recalled Chris Herrmann from Rochester Red Wings. March 11, 2013 Minnesota Twins optioned Chris Herrmann to Rochester Red Wings. September 14, 2012 Minnesota Twins selected the contract of C Chris Herrmann from New Britain Rock Cats. January 3, 2012 Minnesota Twins invited non-roster C Chris Herrmann to spring training. May 4, 2011 Chris Herrmann assigned to New Britain Rock Cats from Fort Myers Miracle. January 11, 2011 Minnesota Twins invited non-roster C Chris Herrmann to spring training. April 7, 2010 Chris Herrmann assigned to Fort Myers Miracle from Elizabethton Twins. June 23, 2009 Chris Herrmann assigned to Elizabethton Twins from Minnesota Twins. June 21, 2009 Minnesota Twins signed Chris Herrmann.